Your Library Card gives you access to over 800,000 different items from 43 public libraries, as well as access to other online resources and databases! Parents must sign the application form for children under 14. Not a resident of Middleton? Anyone in the South Central Library System can apply. If you are outside the system and are a Wisconsin resident, we can probably provide you with a library card. Please ask! The Middleton Public Library does not issue library cards to out-of-state borrowers. Please inform us about any change of address, phone number, or email. Please report lost cards as soon as possible. Call 827-7401. Have a card already? 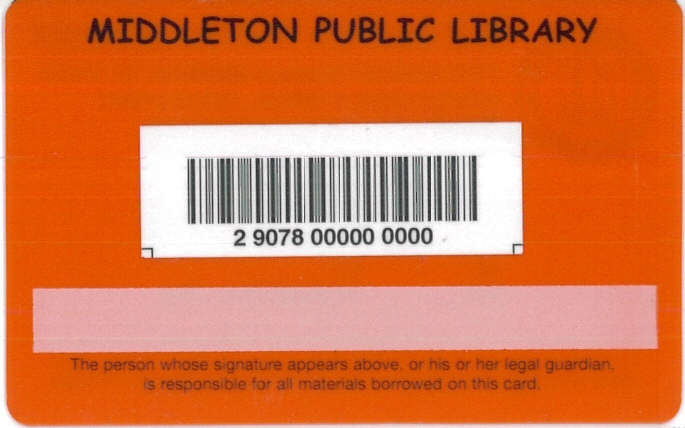 The Middleton Public Library accepts scan-able card images stored in smart phones. Click here to learn more, or to have a scan-able image emailed to you. Most items may be renewed twice, unless there is a waiting list. Renew items in person, by telephone, or online via LINKcat. our Circulation Desk at 827-7401. Barcode and PIN are required by telephone or online. Middleton does not charge daily fines. For more information, please refer to the library's Circulation Policy. If items remain overdue after 27 days, a bill is sent for the replacement cost of the item. EACH LIBRARY IN THE SOUTH CENTRAL LIBRARY SYSTEM HAS ITS OWN RULES REGARDING CIRCULATION AND OTHER LIBRARY USE. A book drop is located on the west (parking lot) side of the library. It may be used 24 hours a day. All types of materials my be returned at the outside book drop, unless the item's label explicitly says to bring the item to the Circulation Desk. There is also a return slot for materials in the library lobby. Materials from any member library of the South Central Library System may be returned to any of the member public libraries and the Dane County Bookmobile.